The course profile held the key to this stage’s story. Starting in Longford, this road stage was pretty much flat for 55km and finished with 17km of almost unbroken climbing to the finish line. You could tell the final climb was looming large in everyone’s mind as we set off from Longford shortly before 2.00pm just as rain started to fall on the start line on cue. Lots of little attacks peppered the course as soon as the neutral zone ended but with such a short stage no one was prepared to give anything a chance and the group kept coming back together. Me, Bridget, and Deacs rode near the front and jumped into any breakaways that formed ahead of the climb while Kmac and Lizzie sat in and stayed fresh for the finish. Making our towards the bottom of Poatina. Image credit: Con Chronis Photography. Things were livened up when an industrial farm sprinkler pelted down on the peloton just as we were winding up for the intermediate sprint around 27km in. It had been raining continuously since the race started but it’s so normal now for any NRS race to be held in the wet that I had barely noticed. The sprinkler certainly woke everyone up – it was like having a bucket of water thrown directly into your face and it was not particularly clean water at that. I’m still waiting to see what new and exciting diseases I may be harbouring from this unexpected Tasmanian shower. Despite the sprinkler, everyone stayed upright and before long we’d made it through both sprint points, the rain had finally stopped, and we were at the base of the Poatina climb. Grey skies all day for Stage 1. Photo credit: Con Chronis Photography. We made it through the first 4km of climbing with the peloton pretty much intact. No one was really pushing the pace yet as anyone keen for the stage win had probably done their research and knew that at this point a short descent in the road was likely to bring riders back together if they had attempted an early escape. After that little downhill, and another kilometre or so of false flat the final ten kilometres loomed, and they were certainly tough. From this point the gradient averaged 8 per cent and at times it felt a lot steeper. Still with 9km of racing to go the pace became too much for me and I dropped off the bunch. At this point the instructions for me, Bridget, and Deacs as the domestiques in the team were just to climb at our own pace and ensure we made the time cut. Kmac in the final group of five going up Poatina. Photo credit: Con Chronis Photography. It was a different scenario for Lizzie and Kmac, however. Both excellent climbers, they were definitely real contenders and I watched them disappear into the distance to race their legs off in an effort to finish on the podium. As the three workers of the team battled up the slopes at our own respective speeds, Kmac and Lizzie absolutely killed it. When I finally struggled over the line after more than 40 minutes of uncomfortable climbing, I found Dan who let me know Kmac had come fourth on the stage, and Lizzie came eight – just brilliant results. Justine Barrow, a rider from Total Rush had won the stage with some amazing climbing. 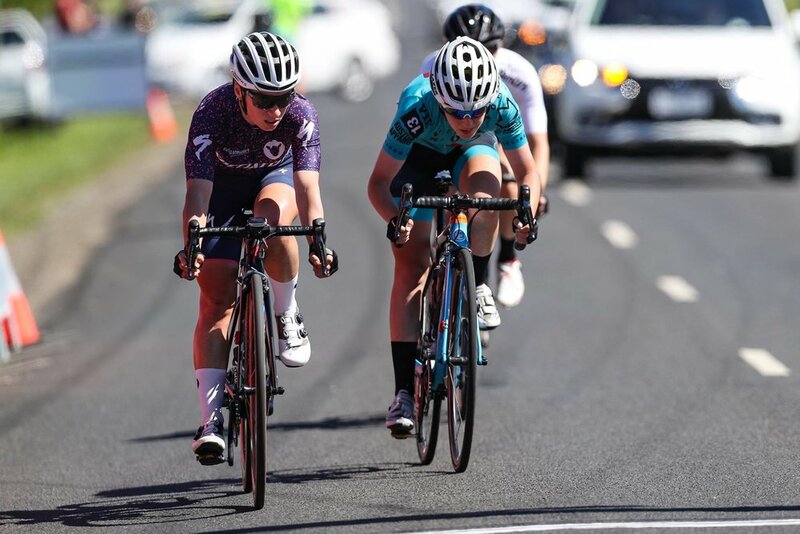 She had attacked the lead group repeatedly until it was whittled down to five riders, then she rode away to claim victory over a minute ahead of second place. The course for the second stage was completely different from stage one. The road from Ulverstone to Riana was either up or down the whole way and if we weren’t climbing or descending we were negotiating tight corners that almost no one in the peloton had ridden before. As soon as the race started it was hectic. The end of the neutral zone coincided exactly with the beginning of the first climb of the day and it was game-on straight away. I can’t recall many other races where I’ve thought I was going to have to get in the van within the first twenty minutes, but this was one of them. Sunshine for Stage 2. Photo credit: Con Chronis Photography. The short, pinchy climbs kept coming and I found myself drifting off the back as someone pushed the pace hard at the front just when we were approaching the first sprint point of the day. I was pushing hard to get back onto the wheel in front when suddenly I noticed our 4th placed GC rider, Kmac, standing on the side of the road with a broken spoke. Bridget and Deacs were both near me and we all saw her. Lizzie (L) and Kmac (R) both stayed near the front for all the climbs. Photo credit: Con Chronis Photography. A few of the convoy cars hadn’t pulled around us and were driving close behind so it was hard to spot Kmac coming. When she did she was motoring so fast she almost dropped both of us straight away. We were a group of three now. Bridget pulled through for a turn, then nasty little hill loomed in front of us. Kmac got on the front and set a very painful pace, I was redlining just holding her wheel. Bridget had to back off so then it was just the two of us riding as hard as possible over the crest. Once we got over the top I rolled to the front and started working. My god, the noises I was making probably had Kmac thinking I was about to have a heart attack. We spotted three riders ahead of us and the back of the convoy behind the peloton just in front of them. I put my head down and pushed as hard as I could to shut the gap. I have no idea how long this took – it felt like forever but was probably only a minute. We got to the back of the group of three and I was absolutely cooked and couldn’t even sit on. I watched Kmac start jumping across the gap to get onto the back of the cars almost straight away and was pretty confident she would get there quickly. All this had happened before we were even 30km into the race! I pedalled along on my own at a steady pace trying to catch my breath and before long was joined by Bridget and Deacs. No time to admire the view on Stage 2. Photo credit: Con Chronis Photography. It felt pretty grim to be riding along outside the race envelope before we’d even reached the halfway point of the stage. We did some frantic and not very accurate calculations of how quickly we needed to ride to make the 15 per cent time cut-off but there was so much guessing involved we decided to keep it simple and ride hard, but not stupid hard. We settled in and got organised rolling solid turns. I think we were all pretty surprised when we spotted the convoy not too far ahead after around 10-15km of our unofficial TTT. We car-hopped back through the convoy and saw that Lizzie and Kmac were still comfortably in the group. The terrain was really tough and the first QOM point of the day came up quickly. The opening 200m was at 16 per cent so it wasn’t really the respite my legs needed after a chase effort. More amazing scenery from Stage 2, no filter required. Photo credit: Con Chronis Photography. The race broke up a lot after the QOM and the nature of the course ensured it stayed that way with a sprint point just 900m after the top of the QOM, then a fast descent and just a few kilometres of flat riding across a valley floor to the base of the final climb, Gunns Plains. And what a final climb! It might only be 3km long according to the technical guide but the first kilometre is a 15 per cent ramp that makes you dream of a 32-tooth cassette and the final 500m is a 13 per cent ramp that makes you wish you were dead. Plus there’s plenty of steep hell in between and around 4km of additional climbing to be dealt with once you pass the official QOM ‘finish’. Lizzie and Kmac in the first chase group on Gunns Plains. Photo credit: Con Chronis Photography. With legs pinging and twinging with the beginnings of cramp, we all battled through and made it to the finish line to find out what had happened at the front of the race. Our girls killed it. 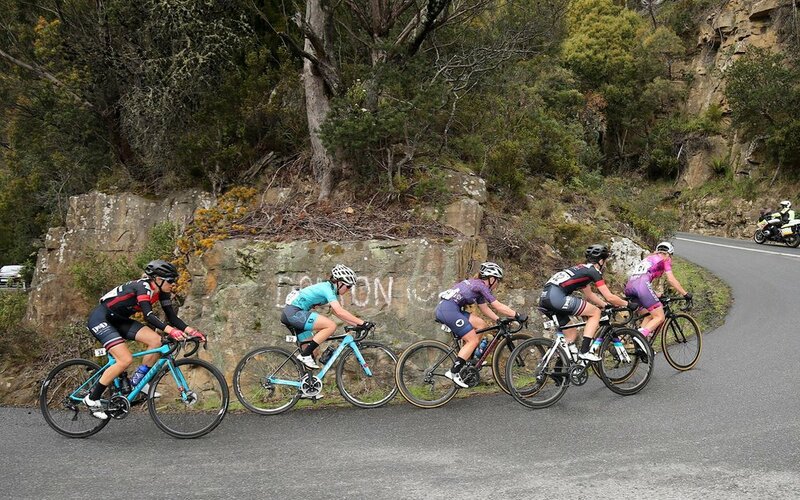 Kmac and Lizzie climbed like champions and rode with the first chase group over the top of Gunns Plains. They were pulling back the two lead riders, Justine Barrow and Jamie Gunning, but couldn’t quite shut the gap. Kmac finished fourth on the stage just 12 seconds behind the winner, Justine, while Lizzie finished in sixth a few more seconds back after having worked hard for Kmac in the final kilometres. Kmac (R) fights it out for fourth place with Sharlotte Lucas (L). Photo credit: Con Chronis Photography. It was a nice sunny morning down by the water in Devonport when we lined up for the final stage of the tour. The course was quite straightforward, nothing too technical, no climbs or descents, and just two intermediate sprints before the finish. Crit day is always an exciting day. It’s high speed and high stakes – unexpected things can happen. 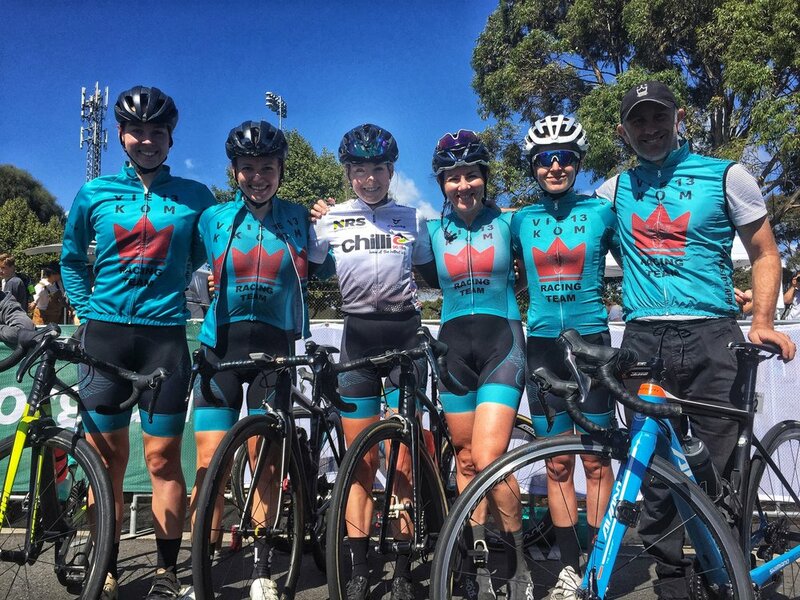 Our goal for the day was to prevent Grace Brown from team Holden Gusto from taking any time bonuses in the intermediate sprints or the stage finish to prevent her from overtaking Kmac in the GC standings. Grace was only 6 seconds behind Kmac so could definitely leap frog her into fourth if we weren’t careful. Things kicked off at 9.00am and first few laps were pretty sedate but definitely started to ramp up before the first sprint on lap 8. 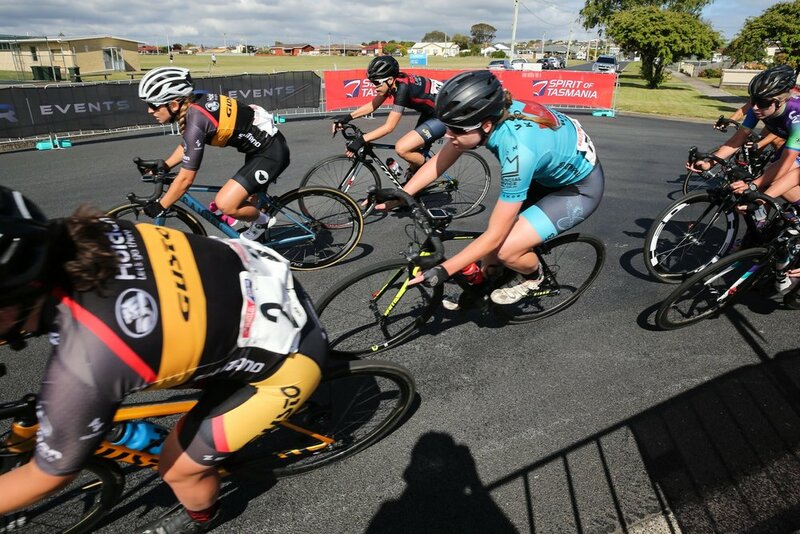 As we rounded the last corner onto the finish straight I saw Kmac sitting right on Grace’s wheel, ready to go, but it didn’t look like Grace was contesting the sprint and they both rolled over the line mid-pack. Kirsty Deacon takes the final corner of the crit on Stage 3. Photo Credit: Con Chronis Photography. A few laps later on we were cruising along the finish straight again and there was a noticeable lull in the pace. Without warning, just to my left, there was a sudden touch of wheels and I heard the crunching, splintering noise of a crash unfolding just behind me. About seven riders came down, Bridget included. The pace slackened for the rest of the lap until we came around again and saw that no one appeared to be seriously hurt and the race didn’t need to be neutralised. It was back to business and almost all the riders who crashed re-joined the race within the next few laps. The next intermediate sprint came and went. The Sydney Uni Staminade team set up a successful lead out for their sprinter, Georgia Whitehouse. Again we watched Grace carefully but again, she didn’t pick up any bonus time. At this point in the race it became apparent that while they weren’t interested in the intermediate sprints, Holden Gusto were keen to win the stage. As we continued to fly around the circuit one after another Holden rider took turns to attack the peloton. It made the final half a dozen laps fast paced and very exciting. Even though Holden were attacking relentlessly and pushing the pace hard, Sydney Uni Staminade still managed to take control of the front of the race on the last lap. As we rounded the final corner I was too far back to see exactly who was on the front. I knew Kmac and Lizzie were both in front of me and I hoped for the best. I rolled over the line in 20th spot and went to find out what happened. Georgia Whitehouse had taken the win very narrowly over Ruby Roseman-Gannon from the Luke’s Health team. Kmac had finished safely in 10th with Lizzie in 9th. All smiles at the end of the Tour of Tassie! L-R Kirsty Deacon, Bec Stephens, Lizzie Stannard, Bridget Bremner, Kirsty McCallum, Dan Corbett. Photo credit: Flick Wardlaw. As we congregated back at the team van and started to think about where we could get coffee, a race official came over and told Kmac she was needed at the podium for presentations. The team all rolled over to the presentation stage to watch, still confused as to why the fourth-place winner for the tour was needed. It became apparent as the presentation began that Sharlotte Lucas from Specialized had been caught up in the crash mid-race. She had experienced a problem with her bike as a result of the crash and it had taken a couple of laps to sort it out. When she re-joined the race, commissaires decided to issue her a time penalty. No one wants to benefit from someone else’s misfortune, but we had no ability influence this decision and could only be happy that our hard work had delivered Kmac into a high position on GC which then became third overall because of a crash in the final stage. It’s a cliché, but that’s bike racing and you have to take the good luck with the bad.